Betsy Munroe and Claude Saks welcomed our newest member Ted Deck. His classification is mineral leasing. 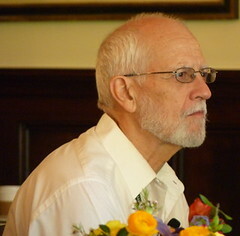 Bill Ringer is his mentor and he was proposed by Claude Saks. Lucille Ramirez announced the La Cuesta Student of the Month: Lily Flores. The principal, Fran Wageneck, talked about the school. Most of the students are not there because of discipline or court-system reasons. It’s a comprehensive high school. It’s one of four schools that are under the umbrella of alternative schools in Santa Barbara. Lily’s teacher, James Bedard, said she exemplifies what it is to be a firebird (the mascot). Since she’s been at La Cuesta, she’s earned straight As. She even takes on online course in trigonometry. She helps out with three siblings. His favorite part is there is a sixth period on Fridays. He teaches a cooking class. Lily always comes and is eager to help. She stays late on a Friday because she wants to be helpful. She is graduating this year. She also is a community translator. Lily plans to go to the community college for two years then transfer to San Diego to study interior design and lighting to help her dad with his business (Flores Lighting). Reminder: Next Weds. is DARK. No meeting on 11/27! Jim Ruh called for responses to the fundraising ballot. We are trying to get a sense of what direction the club wants to go. If as a result of this survey, if there is no consensus, then the board and club has to work on developing one before the committee does any more work. Jim agreed to chair the fundraising committee next year if needed. Bill Ringer announced that the Philippines typhoon money collection is already at $700. Additional donations were collected. Kim Coley: Food drive/collection today for Unity House. Thank y’all for your support. Special shoutout to Tom Heath for all his hard work coordinating Camp Whittier. Press releases have been sent. Sandy Boyd took great pictures to capture the day. Thanks for everyone who brought canned food. We have about 200 items. The club is donating $1,000 to the Food Bank to buy turkeys for Thanksgiving. Connard Hogan announced dictionary deliveries. We have a delivery this morning and we have other dates coming up. Please sign up so we can coordinate deliveries. Diana Cecala shared holiday party details. We have everything planned, and the RSVPs are pouring in. We have some space constraints (68 people + 2 servers = 70). We need everyone to RSVP so we can have a clear list. Please put guest or spouse’s name. 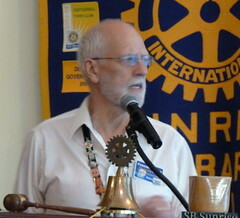 Don Bennett reminded members about Salvation Army bell ringing. We kick this off the Saturday after Thanksgiving. Helps the Salvation Army. Tom Heath: Sunrisers did a lot of work at Camp Whittier on Sat. Thank you everyone, great job. 32 people signed up but only 19 showed up. David Velarde and Bill Abel even went back on Sunday to do more work. Thank you to everyone who helped out. Tom’s two employees were there and helped out, too. Janet Napier reminded members that this is the time of year to turn in our pledge forms for our annual fund, our club’s foundation and punch cards. By today, we have only received seven. Turn in to her or Fred Gaeden. Joe Clark met with Deepa Willingham about the 25th anniversary of women in Rotary. There will be an event on March 8 for the district. It will be a gala event to celebrate women in Rotary and also The Rotary Foundation. This area is looking to raise a minimum of $25k. In total, the goal is $100k. Gala dinner, fairly inexpensive, and caveat to it – going to do a dancing with the stars fundraiser. We’ll have celebrities dancing with the dance students around the area. Teams can be sponsored for $2,500 and will compete. The top teams will get money to be donated to the charity of their choice. We want to celebrate “firsts” – first woman member, first woman president, etc. We will be hosting at the Santa Barbara Elks Club. Andrew Chung and Darren Doi announced that 1 member stepped forward to help run a committee for the golf tournament in 2014. They need 2 more by the end of Nov. By early Dec. they have to commit financially to the golf club. Do we have 2 more people who want to help coordinate the golf tournament in May 2014? If not, we will have to cancel the tournament. Ted Deck won the raffle. 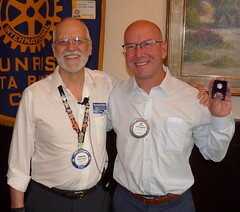 Program: Joanne Schoenfeld Orenstein introduced Travis Wilson to talk about “How to protect yourself from fraud.” He is a forensic accountant and came highly recommended by other clubs. He works primarily with nonprofits. He is also part of a company called Fraud Hotline, an anonymous reporting service. People who commit fraud look very much like people in this room. If they didn’t look trustworthy, they would not be able to commit fraud. Would you ever be able to commit fraud? Home foreclosures, medical bills, student college tuition. Lots of examples of local fraudsters including the SB Olive Company which was forced to sell for just assets. Businesses are embarrassed, and nonprofits are afraid it will ruin their reputation, so small businesses and nonprofits are disproportionately reported. There is a Fraud Triangle – rationalization, opportunity, motivation. You don’t have control over two of the factors but you can control opportunity. How did you get involved? He primarily audited nonprofits. In CA they are required to have a whistleblower policy. Usually they say just see the executive director but this is not ideal. You should really have a third party. It removes people internally from the process. Other companies out there are for for-profit companies, but Fraud Hotline is lower cost, for nonprofits. What should they be looking for, red flags? He can’t say there is any one thing. Living outside of your means, gambling habits, alcoholism, and drug abuse. Would you say that most of the fraud is very elaborate in hiding their trail? No. Unfortunately, if someone had just looked or known where to look, it would have been very obvious. These are not very complicated fraudsters. Do you work with the police? Not really. They act as a middle-man. On 12/4, The SB Arts Foundry will be here to tell us about the lost wax process.